The availability of advanced mobile devices at a very low cost generates massive amounts of signaling data in cellular networks that can be turned into spatio-temporal observations of human mobility. These observations will fundamentally change how we understand human travel behavior and how to operate and optimize our transport systems. Better estimation of travel demand, mode choice and route choice is central for a key functionality of future smart cities with dynamic and integrated multimodal control of the transport system. The project is a continuation of the project "Travel demand estimation based on cellular network data" (MODE), that ended in December 2016. Within the project, key functionalities for efficient management of cellular network data have been developed and evaluated based on operator data. The project has developed one of few platforms in the world for analysis of large amounts of cellular network data for transport applications. For the continuation project, a mobile operator together with more end users are joining the consortium, which now constitutes an internationally unique competence in the intersection of cellular networks, traffic modelling and big data analytics. The aim is to achieve both fundamentally new understanding of mobility patterns as well as a product that offers access to estimated travel demand. The project will focus on a number of unexplored applications of dynamically estimated mobility patterns. The applicatrions are highly prioritized by the end users of the project: 1) Public transport planning, 2) Traffic management, 3) ex-post evaluation of infrastructure investments, 4) estimation of long distance travels, and 5) ride sharing potential of Mobility as a Service (MaaS). Meeting: First MOFT project reference group meeting; with representatives from Linköping University, SICS, Ericsson, Trafikverket, Tele2, Nobina, Samtrafiken, SJ, and Sweco, Campus Norrköping, January 30, 2017. Seminar: New sources of input data for travel demand estimation models, at Matematiska kollokviet, Department of Mathematics, Division of Mathematics and Applied Mathematics, Linköping University, February 1, 2017. Seminar: Mobilnätsdata i framtidens transportsystem (in Swedish), at Samtrafikens planeringskonferens 2017, Kollektivtrafikens hus, Stockholm, February 8, 2017. Seminar: Transportanalys och visualisering – resmönster från data i mobilnätet, at Smarta Städer, November 22-23, 2017, Kistamässan, Stockholm. Meeting: MOFT project reference group meeting, Campus Norrköping, December 1, 2017. Seminar: Resestatistik för långväga resor baserat på aggregerade och anonymiserade mobilnätsdata (in Swedish), results from a MOFT sub-project was presented at Transportforum 2018, Linköping, January 10-11, 2018. Presentation by Trafikanalys. N. Breyer, D. Gundlegård, C. Rydergren and J. Bäckman, (2017), Trip extraction for traffic analysis using cellular network data, 2017 5th IEEE International Conference on Models and Technologies for Intelligent Transportation Systems (MT-ITS). Available at IEEE. Based on results from the MOFT project, two sub-projects have been carried out during december 2017 and 2018. The sub-projects have got funding from the agency Trafikanalys. Information about the settings for these two sub-project is presented at Trafiknalays.se/resvaneundersokning. The focus in this sub-project was to varify the qulity of long distance trips identified from mobile network data. The trip identification and scaling was performed by Telia Sverige. The identified, scaled, trips were in the project compared to the official statistics of long distance trips (trips longer than 100km) based on travel survey (RVU) data. The data and the statistics (RVU) was compared on a geospatial level of counties (län). The final report from this sub-project, in Swedish, is available at Trafikanalys. 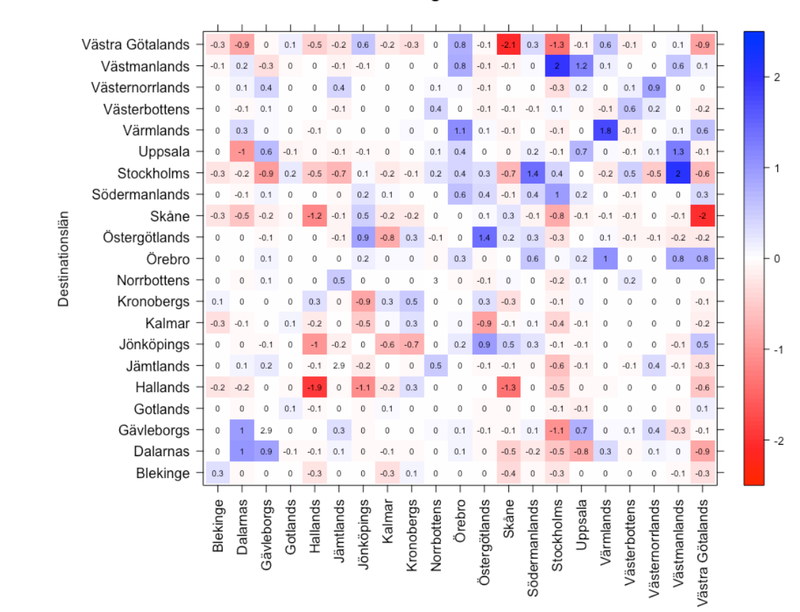 In this sub-project we have analyzed data covering the municpality of Norrköping. We have applied the algorithms and tools developed in the MOFT project to data at Telenor. 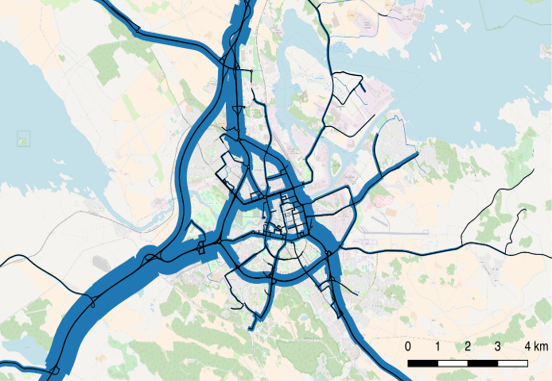 Results in form of travel demand matrices are precented, and these matrices are, on an aggregate level, compared to the mobility that is use in the traffic forcasting model of Norrköping. The final report from this sub-project, in Swedish, is available at Trafikanalys. The project is funded by Vinnova for 2017-2020. Project partners are Ericsson, RISE, Trafikverket, City of Stockholm, Sweco, Tele2, SJ, Nobina, Samtrafiken.